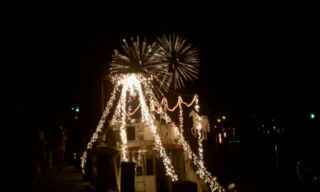 One of the lighted boats docked right by us (D, C, R, & I) making a nice foreground for our fireworks shots. :-) It was a lovely hot summer night in St Joe! The chocolate brownie sundae we got from Coldstone Creamery at the festival was just the thing to help cool us down. What fun!